The most recent film by cult director, Quentin Tarantino. Set in southern American slave country in the late 1850s, Django Unchained is one in a long line of loose reinterpretations of 1966 Italian western, Django. The film’s title character, played enigmatically by Jamie Foxx, is a black slave who is freed by German bounty hunter, Dr. King Schultz, played by Christoph Waltz with his usual articulate charm. The first half of the film develops the relationship between the two against a backdrop of increasingly bloody violence. As Schultz schools Django in the arts of his trade, Tarantino’s trademark gore flies thickly and quickly. The second half of the film steps up its inevitable tension with the introduction of slaver and mandingo “breeder”, Calvin Candie (Leonardo DiCaprio). A mandingo is a black slave who, for the sport of his owner, fights bare handed against other slaves to the death. While we were of course put in mind of Rome’s gladiatorial contests, Tarantino substitutes the colosseum’s theatricality with the harrowing intimacy of Candie’s parlour. And though there is little historic evidence to suggest mandingo fighting actually existed, its stomach-churning plausibility amplifies its on-screen power. In addition to his disturbing taste in sport, Candie also owns Django’s wife, a house slave with the surprisingly German name, Broomhilda. Fascinated by this coincidence, Schultz assists Django in his attempt to free her with the ruse of an interest in purchasing one of Candie’s fighters. As Schultz explains, Django is the Norse hero and maiden mythology’s Siegfried, setting out to rescue his wife from her captor. 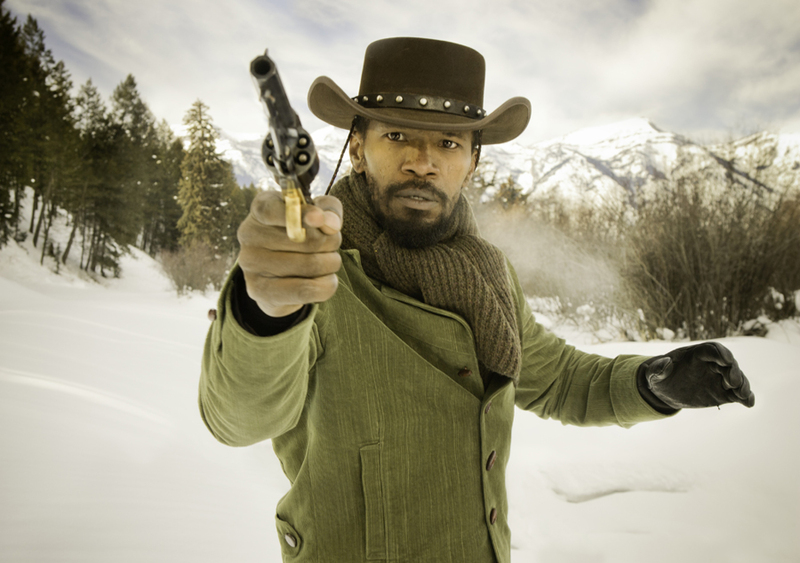 We love Tarantino’s films and Django Unchained is no exception. It is political, violent, funny, meaningful and entertaining: Foxx, Waltz and DiCaprio are joined by a high quality cast who all give outstanding performances; the plot is characteristically simple yet masterfully woven; the western genre is exploited brilliantly; and the subject matter is serendipitously poignant given the concurrent release of Steven Spielberg’s Lincoln. 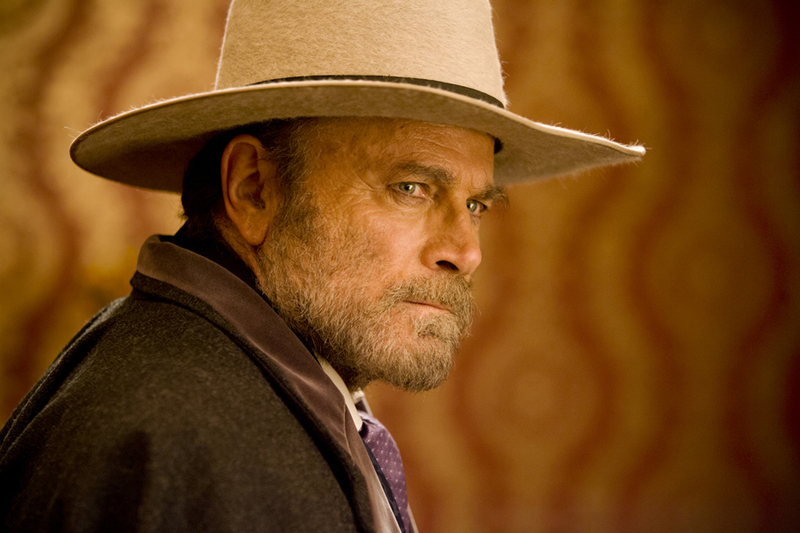 Tarantino explores his usual richness of cinematic references and oddball character placements, starting with a cameo by Franco Nero, the notably well-preserved actor who played the original Django. The hilarious and disturbing scene of a Ku Klux Klan mob storming a hill echoes a similar scene from Seven Samurai (1954); there are songs from the musical scores of 1960s Italian westerns; rolling text that recalls Gone With The Wind (1939); and our favourite, a small part played by Tarantino himself doing a remarkable rendition of a broad Australian accent. We are pleased to see him working again with some of his favourite actors: Waltz and Samuel L. Jackson. In fact, Tarantino goes a step further, developing not only a character but an entire story arc for the German and French speaking Waltz. It is clear that Tarantino has an uncanny gift for rewarding unrecognised talent: a brief survey of their filmographies reveals that Waltz has shifted into Hollywood stardom since Inglorious Basterds (2009), as has Michael Fassbender. John Travolta is another prominent benefactor, his career receiving Tarantino’s kiss of life with Pulp Fiction (1994). Given the degeneracy the tabloids constantly insist defines Hollywood, it is satisfying to see glimpses of professional and personal integrity at work here. In this and other ways, Tarantino is one of only a few contemporary Hollywood directors whose creativity and unique voice stamp an undeniable energy on a film. In our opinion, matched only by Wes Anderson and the Coen brothers, who have also nurtured lasting relationships with particular actors, Tarantino justifies his cult following. But what is most striking about this film is Tarantino’s dedication to revisionist history. Much like Inglorious Basterds, which (spoiler alert) saw Adolf Hitler shot repeatedly and gratifyingly in the face with machine guns, then exploded and then set on fire, Django Unchained re-imagines the dark slave era as a place where a black man can have the guts, skills and luck to take down an entire plantation of white slave owners. We all have that innocent schoolboy within us, the one who dreams of beating to a pulp one of history’s many evil legends. Tarantino however also has a Hollywood studio and considerable budgets at his disposal to turn these idle dreams into cinematic realities. One of Tarantino’s best: 4.5 stars.